The Audioquest DragonFly digital to analog converter is perhaps the most unconventional product we have ever carried. It is no larger than a USB memory stick, yet this DAC will play a critical role as an interface between your computer and sound system. At $149, the DragonFly Version 1.2 is more than just a great value – it has excellent sound quality. Absolute Sound magazine named DragonFly as the “affordable digital source of the year” for 2012. In addition to this award, this innovative USB DAC was chosen as the “computer audio component of the year” and “ budget component of the year” for 2012 in Stereophile magazine! An outboard high quality DAC (digital to analog converter) can be used to significantly improve sound quality when using your computer as a music source. Bypassing the low quality DAC in your computer and replacing it with a higher performing alternative is an important step in the audio chain. The DragonFly will accomplish this extremely well. Versatility is another key benefit to this unique product. The DragonFly can be used in many different applications. Use the fixed output of this DAC when connecting a computer to your stereo or home theater system. 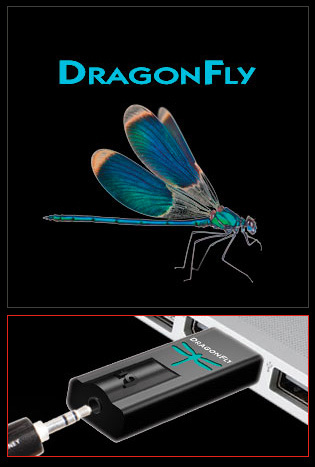 The DragonFly also provides variable output, allowing the computer and DAC to be directly connected to a power amp or powered speaker (Paradigm A2 powered speaker for example). Another option is to use your laptop and DragonFly on the fly and utilize the high quality Burr Brown headphone amplifier for portable use. 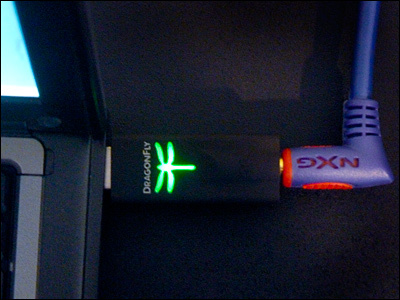 The Audioquest DragonFly is versatile, diminutive, affordable, innovative and very cool. It offers very impressive sound quality and is a wonderful link between the computer and your ears!